We received the box, and the battle was on. With three team members, and several other curious folks in the building who are avid Braille users, there was a minor scuffle as the team negotiated for time with the latest bright shiny object. After several promises to share the fun with all of our eager readers, I managed to wrestle it away from the others just long enough to put it through its paces as a Braille notetaker. Likewise, Karl (who managed to grab it first) looked at it as an Android device. We had to promise to share the new toy, so this is not a comprehensive review, but hits some of the biggest highlights, and our initial findings. The Polaris looks great. The body is sleek and small in shiny black. It comes with a semi-rigid plastic case with magnetic closure. The device and the case both feel sturdy and well-built without being overly bulky. The keys feel nice under the fingers, with decent travel, and a fairly quiet key press. The Braille display is pleasant to use with crisp dots and a matte finish that feels a bit like paper as you read from it. The Polaris has respectable hardware for a mobile device including support for features like Wireless B, G, N, or AC; 3 GB of RAM; 64 GB of storage; USB 3.0; a 13-megapixel camera; and several other goodies which will hopefully keep it relevant for the foreseeable future. Overall, when it comes to design, the Polaris appears to be a sturdy machine with well thought out hardware. Being lighter, sleeker, and quieter than the competition will make it attractive to some users as well. Well, um… all right. This is where things get a bit more… complicated. How can I put this? I don’t want to be overly critical of a brand-new device, but frankly, I am bored. 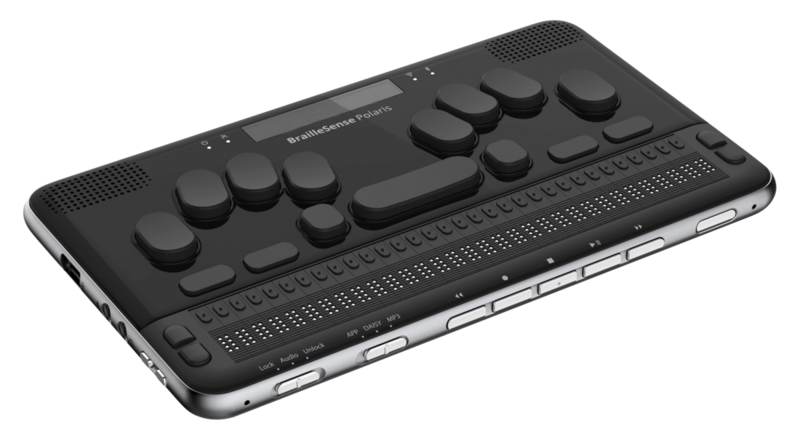 The built-in programs are, so far as I can tell, mostly re-creations of the BrailleSense U2’s software on top of an Android shell. Don’t get me wrong, there are some real benefits to this approach. First, it’s going to take almost no work at all for existing BrailleSense users to get up and running. The features match so perfectly that I didn’t have to look up anything not already used every day in my own BrailleSense Plus. So, on the up-side, it’s going to be easy to teach and learn for anyone who has ever used a BrailleSense product in the past. The power of Android is certainly providing benefit for the web browser which is functional, if not overwhelming in its speed or feature set. This is an important improvement, because the U2 and other Windows Mobile-based notetakers were pretty much useless on the internet for the last several years. So this was certainly a necessary and welcome upgrade. Further, the Android base has allowed the HIMS developers to create a truly functional visual interface for when the device is being used with teachers or others who want to see what’s going on with the device on-screen. Unfortunately, this is where the benefits end. At present, we are missing features that existed in previous versions of the BrailleSense line. One major example of the Polaris lacking features is in the email application. It is true that the Exchange support in the U2 was quite poor in my experience, but Android should have made supporting Exchange much easier. Despite this, the native email client can only be set to work with POP3 and IMAP accounts. The features of the core suite of applications do not appear to have been extended or enhanced. For example, the user will have the same experience using the Word Processor today, as they would have had on a U2 or even a Plus. As the Word Processor was rebuilt on the back of Polaris Office, this is a baffling choice. It was actually necessary to remove text styling and other features of the package to re-create the older BrailleSense experience. Even more frustrating, if a user places a document into the device which has been highly formatted, it reads as though it were not. Finally, several of the older features of the BrailleSense have been stripped. It is assumed that these features were removed as they are replicated by Android applications, but unless the apps are accessible and easy to use on the Polaris, the removal of features like Dropbox and YouTube will harm productivity. Since I’m not our resident Android fan, Karl very helpfully wrote up his experiences using the Polaris as an Android device below. As much potential as the Polaris has with running Android apps, the current state of that support leaves much to be desired. Navigating through apps is inconsistent and uses a completely different command structure than the rest of the device, apps generally run slowly and hang or crash frequently, and the whole experience feels half finished. When I first started navigating in an Android app, I naturally went for the space+dot1 and space+dot4 commands that work everywhere else in the BrailleSense and in most other devices, but was surprised when these didn’t work. Next I tried the space+dot4,5 to emulate the tab key, and this mostly worked but was inconsistent. I finally had to look in the manual to determine what I needed to do to navigate in apps, which is F3 and space+F3. With this knowledge in hand, I jumped back in and had better success this time. I managed to get some apps downloaded, but not without significant slowing at times, and some inconsistent navigation. Load times were also extremely long, with Google Play Music taking a minute to load in one instance and crashing in others. Apps can be downloaded from the Play store, just like on any other Android device. Once an app is installed, it is launched from the “All Apps” menu off the main menu. I noticed a few odd things here. Google Play Services, which is a system service and not an app in the regular sense, is shown in this menu when it shouldn’t be. I also noticed the Google Now launcher in the apps menu. The manual has dire warnings about accessibility being disabled if the Google Now launcher is set as the home launcher. This begs the question of why it is on the device in the first place. If it is accessible, then don’t artificially kill accessibility services when it gains focus. If it’s not, then what in the world is it doing on the device? Even if it is required for Google certification, as we were informed, many other Android devices do not appear to be loaded with the Google Launcher, so it really should be placed in a harder-to-access location. I see a lot of unneeded potential confusion and headaches over this. On most Android devices, it is possible to bring up the “app info” screen for a given app where notification settings can be managed, you can check the data and storage of the app, uninstall it, and potentially make other changes. This functionality appears to be unreachable directly on the Polaris. The same info can be reached through the settings app, but is much less efficient. Third-party apps, as mentioned previously, are extremely laggy and crash-prone on the Polaris. There is no mention of a method to move by granularity in the manual, which means that moving by links in a web view for example doesn’t appear to be possible. Some apps let you use the f2 key or space+M to open the navigation menu, but others don’t, and there doesn’t appear to be any logical reason behind which behavior happens. When everything managed to work, it was possible to compose an email in Gmail, review my library in Google Play Music, and watch a video in YouTube. Unfortunately, things don’t stop there. It is possible to enter contracted Braille, but this feature seems somewhat buggy. For example, I entered BrailleSense, using the contraction for Braille ‘Brl’, and it translated as ButrlSense. The hints feature also needs work. Having to read “press enter key to select” after everything gets tedious. I’d recommend having it display as a message after several seconds and obey the message time setting. When I was done with being frustrated by Android apps and was ready to pass the unit over to Amy, I wanted to give her a clean starting point. As there was no reset option in the main Polaris Settings menu, I went into the Android settings and performed a factory data reset. The unit started then rebooted several times with no indication as to what it was doing, leading me to fear I’d put it into a reboot loop. Finally, it came up with the Android welcome screen. After having focus issues signing the unit into Wi-Fi, I got to the main menu and saw there were only partial utilities and settings menus. Upgrading the device — which took nearly an hour — restored things to more or less normal, but that ancient firmware really needs to be brought up to speed to avoid a lot of hassle when resetting the Polaris. Unfortunately, we were unable to test the Polaris as a Braille display. During testing, Amy attempted to connect it to her iPhone, as well as to a phone running iOS 11. Initially, she was unable to get the device to pair with either, and she received a message which essentially said that the BrailleSense was not supported. As documentation indicated that this should in fact work, she did the reset process on both and eventually found that she had two instances of the BrailleSense in the pairing list on the phone. One was non-functional. The other worked except for one little problem — it would disconnect after about a minute and a half of connectivity and require a complete repairing process to continue. After much hassle, we spoke with technical support, and sadly, it was deemed our Polaris needed to be returned. Customer service will be sending a replacement, but at this point, we have not been able to confirm the quality of pairing, though we have been assured it ought to work. The BrailleSense Polaris is presently not very exciting. There’s not much to recommend it over the last generation of notetakers, or its current crop of competition. Notetaker features have taken minor steps backwards overall from what was possible in the U2, except for web browsing. In Android apps the situation is even more dire. We cannot recommend the BrailleSense for anyone who expects to rely on Android, at least not yet. There is at least some hope for the future. HIMS has a long history of having fantastic hardware, with software that improves in time. The pattern of excellent hardware design appears to have continued in the Polaris, so it’s hoped that HIMS will expand both the native Android support and the feature set of the core applications. Sadly, in its current state, we just can’t recommend it. There’s nothing new here that works well enough to justify the price tag, but we’ll keep an eye on it and hope for better soon. Have you ever found yourself struggling to remember the series of commands needed to perform a keyboard shortcut on your display?